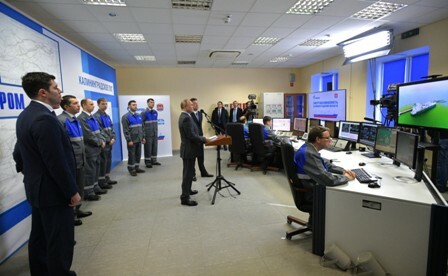 RF President Vladimir Putin visited the Kaliningrad underground gas storage facility and took part in the launching of a gas receiving terminal and a floating storage regasification unit via videoconference, Kremlin says in a press release. The facility built in the water area of the Baltic Sea consists of a berth protected with a breakwater and FSRU Marshal Vasilevsky. The tanker is intended for regasification of LNG delivered by sea for further supply to customers or to the underground gas storage facility, a natural reservoir in abysmal deposits of mineral salt. The vessel’s length is almost 300 meters, width – 46.5 meters, speed – 19.5 knots. The Marshal Vasilevsky's tanks ensure the temperature of minus 163 centigrade degrees. Their capacity is 174,000 tonnes of liquefied natural gas. The Marshal Vasilevsky is the first Arc4 FSRU in Russian International Register of Vessels. It sails the flag of the Russian Federation. According to Igor Safonov, Director General of Gazprom UGS, the breakwater and the terminal are located 5 kilometers off the shore. The depth of 19 meters ensures safe docking of the tanker. The breakwater is able to protect the terminal from heavy storms which are common in the region. The terminal structures made of high-performance concrete rest on 177 40-meter long piles. Special equipment for accepting of gas from the FSRU is located on the terminal. This FSRU project, the first of its kind in Russia, is Gazprom’s gas supply alternative aimed to increase the energy security of the Kaliningrad Region, given its unique location.